This entry was posted on August 20, 2011 by Roc. Served cold, the tart, grape juice-like drink is most commonly called roselle juice in English. Served hot, it's hibiscus tea or Jamaica tea. In English-speaking parts of the world, the plant goes by the names hibiscus, roselle, rozelle, Florida cranberry, flor de Jamaica, Jamaica sorrel, Indian sorrel, Guinea sorrel, sorrel, red sorrel, saril, sour-sour, Queensland jelly plant, jelly okra and lemon bush. In French, it's oseille rouge or oseille de Guinée. In Spanish, it's quimbombó chino, saril, sereni, rosa de Jamaica, flor de Jamaica, agria, agrio de Guinea, quetmia ácida, viña and viñuela. In Portuguese, it's vinagreira, azeda de Guiné, cururú azédo, and quiabeiro azédo. In Surinam, it goes by the Dutch name, zuring. It's known as bissap in Senegal, krajeap in Thailand, chin baung in Myanmar, and asam paya or asam susur in Malaysia. In Sudan, Egypt and elsewhere in the Near East, it’s known as karkadé or carcadé. In Chinese, it's 玫瑰茄 or 洛神花. It’s easy to mistake roselle for a juice in tropical countries because it’s commonly sold streetside and in food courts alongside fresh pineapple, orange, lemon and coconut juices. In Southeast Asian convenience stories, roselle is among the single-serving bottles and juice boxes. It also turns up, as a sherbet, in expensive ice-cream shops. But hibiscus tea has been consumed as a soothing evening tea for centuries in Egypt and elsewhere in the Near East. It probably first made a splash in the prettily-packaged US tea market as an ingredient in Celestial Seasoning's Red Zinger tea back in the 1970s. Botanically speaking, it's Hibiscus sabdariffa L. (family Malvaceae) and it’s the bushy H. sabdariffa var. sabdariffa that produces the edible products.The edible parts used to make “juice” or tea (actually, an infusion) look like reddish dried-up buds. In fact, they’re not flowers but calyces. It’s the calyx, the red, fleshy covering enclosing the flower’s seed pod, which is used for flavoring, cooking and food coloring. The flower of this variety of sabdariffa is yellow, white or light pink. Roselle(Hibiscus) has been used in folk medicine as a diuretic and mild laxative, as well as in treating cancer and cardiac and nerve diseases. Although information is limited, the potential for hibiscus use in treating hypertension and cancer, as well as for its lipid-lowering and renal effects, are being investigated. 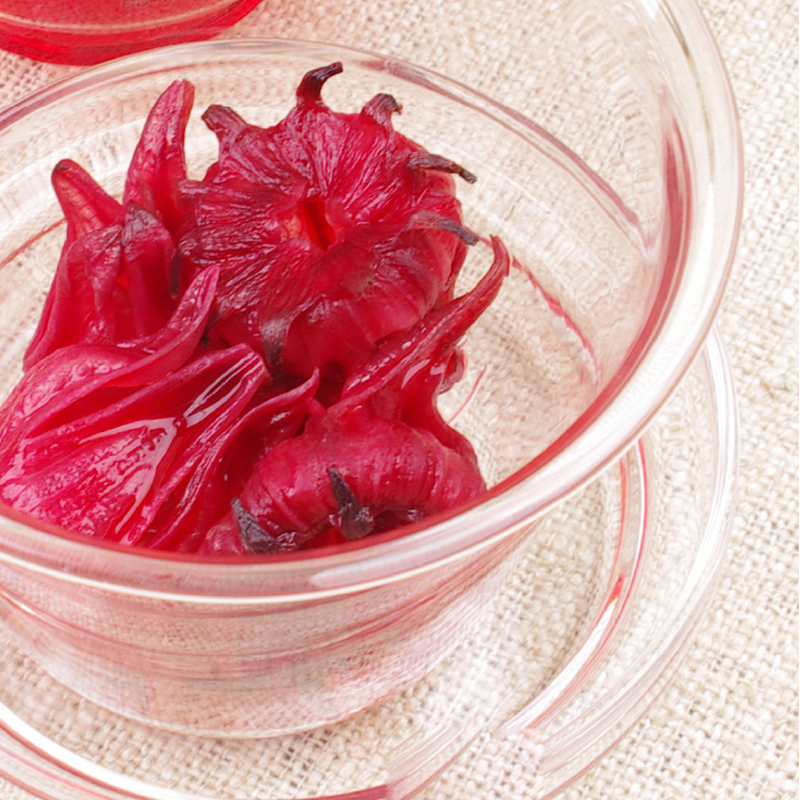 Although roselle is being studied, it hasn’t yet been proven to have the healing powers of bael fruit. It is high in calcium, niacin, riboflavin, vitamin C and iron, as seen on this Purdue University page. And the beverages have no caffeine. In East Africa, "Sudan tea" is consumed as medicine to cure coughs. 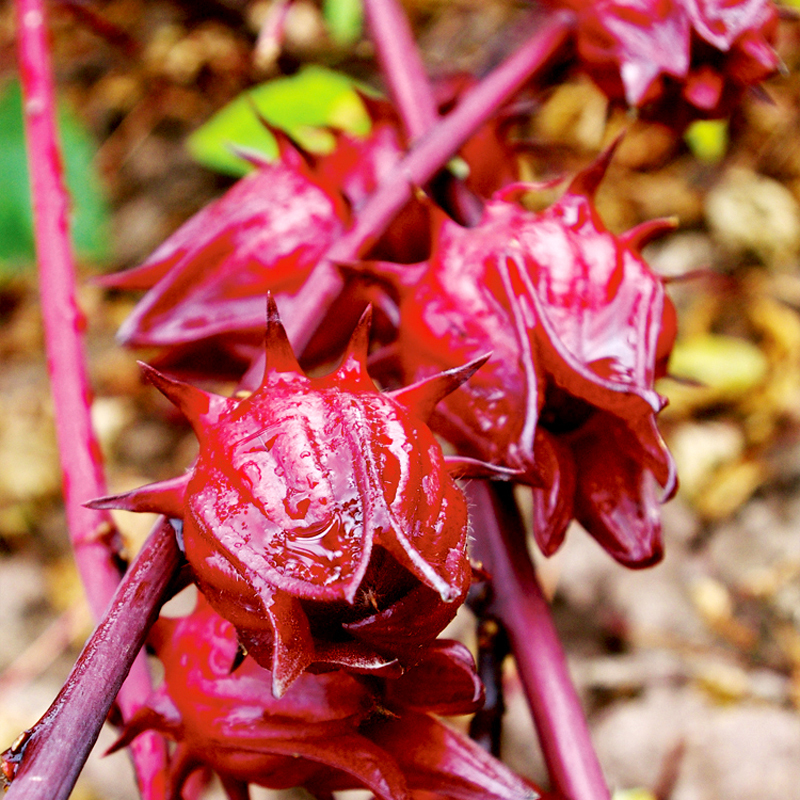 In Guatamala, roselle is believed to cure hangovers. 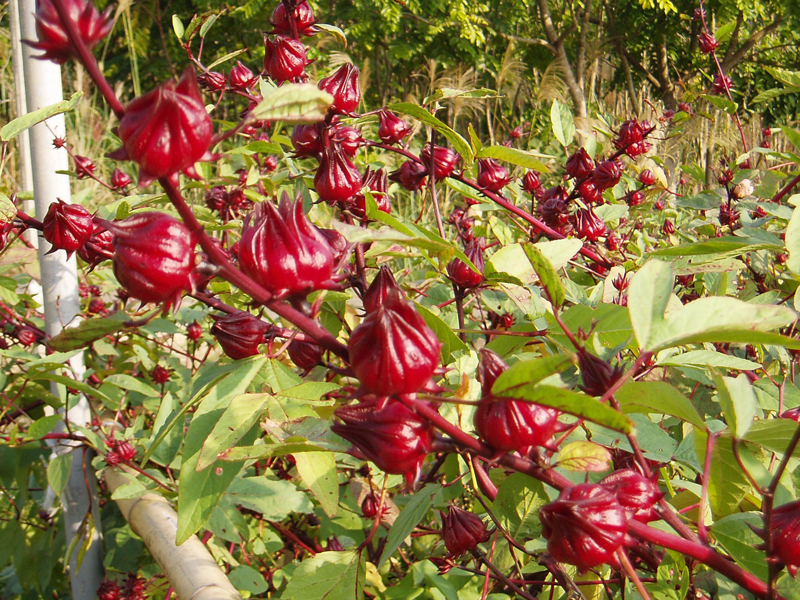 In Senegal, a roselle extract is said to lower blood pressure. In India, Africa and Central America, infusions made from roselle calyces or seeds are prescribed as a diuretic, to stimulate bile production and to treat fever. Hibiscus tea can be drunk hot or cold. As iced tea, the infusion is known to satiate thirst quite effectively. It is often recommended as an alternative to artificially made commercial "sport drinks" that are marketed to physically active individuals. Hibiscus tea's ability to cool the body is well documented by cultures that include it in their diet or medicinal practices. This benefit is probably associated with the diuretic properties of hibiscus, a property that helps in the excretion of excess fluids from the body. The antihypertensive properties of hibiscus tea were noted by a study in which 70 people were involved; half of them drank hibiscus tea once daily and the other half took 25 mg of antihypertensive medicine twice daily. After a month, 79 percent of the tea drinkers experienced a ten point reduction in blood pressure, 84 percent of the ones that took pharmaceutical medicine also experienced the same reduction in blood pressure. Hibiscus is an antioxidant. It has properties that prevents the oxidation of low-density lipoproteins; a substance in our blood that if increased beyond normal quantities may cause high blood pressure. Some tea drinkers use hibiscus tea to aid in weight loss. The body produces an enzyme known as amylase which functions to break down complex sugar and starch molecules in food. When a person consumes too much carbohydrate-rich food (full of sugar and starch) that individual is most likely going to gain weight. According to pubmed.gov, hibiscus contains a substance that can inhibit the production of amylase. A person regularly drinking hibiscus tea can thus prevent too much absorption of carbohydrates and consequently not gain excess weight. According to the book "Healing Herbal Teas," fresh hibiscus flowers contain around 6.7 mg of ascorbic acid, a form of vitamin C, which is one of the more essential nutrients needed by the body. Along with this significantly beneficial substance, hibiscus is known to have anti-inflammatory and mild anti-bacterial properties. Thus hibiscus tea is often used as a supplement to help treat coughs and colds. Because of its cooling effect, it is especially effective in reducing the discomfort of fevers that may accompany such ailments. Besides containing a significant amount of ascorbic acid, hibiscus is made of the following nutritional substances: 1.145 g of protein, 2.61 g of fat, 12.0 g of fiber, 1,263 mg of calcium, 273.2 mg of phosphorus, 8.98 mg of iron, 0.029 mg of carotene, 0.117 mg of thiamine, 0.277 mg of riboflavin and 3.765 m of niacin. Given all this, it can be said that hibiscus tea can serve as an excellent food supplement and an aid to boost the body's immune system. You give us the nutritional breakdown without mentioning the amount of Hibiscus used to make up your sample? thank you for sharing. My mom has lots of this in the garden. The flower is also good for curing hangovers, cough, fever amd common cold. Our tribe uses this as a part of medicine and delicacy since time immemorial. We consume this by making soup out of it. We eat both the leaves and the flowers, the fibre from it's stem is used for weaving shawls and carpets. This is my favourite food. I carry it with me whenver I travell anywhere in the country. Love it - very refreshing!